When September came knocking, we were invited by blogger Aradhana Anand to tour her gorgeous Delhi home. Before returning to India after nearly twelve years, Aradhana had begun re-decorating her room to create a space she could move back to and truly call her own. Our morning enthrallment began in the cosy corner where her sofa sits under the windows. This wooden beauty is from Bali and is colloquially known as a Chibutat. On it lay curled Aradhana’s pet cat Snickers (one among the five feline members of the family) purring and rolling her eyes at the intruders. In her room, there are countless things that draw you in, the color of the walls being the first and most striking. Experimenting with a dark shade looked difficult to begin with, but the lovely charcoal hue that resulted is just perfect. It involved a weekend visit from Singapore and several iterations with the painter to get it right. Other treats include the TV bench from a store in Singapore called d-Bodhi, that specialises in furniture made from recycled boat wood. Then there is the imposing white ‘poem’ bureau from Marina in Delhi, a white element to bring out the grey of the walls. The art on the wall above the bureau is by an Indian artist called Shishir Bhatt, framed to add the necessary pop of color. 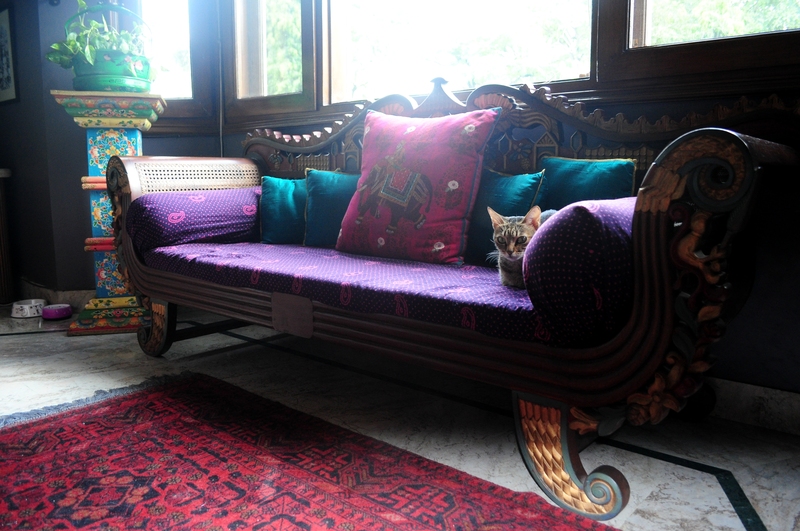 Alongside the sofa lies the painted stand from Tibet, which Aradhana picked up at an antiques store in Singapore. The walls are also adorned with Andy Warhol prints of his cat, Tribal Chinese work, Watercolors from Venice, ‘Whirling Dervishes’ in oil from Damascus, ‘Tree of Life’ mosaic from Madaba, Jordan, Tiles from Capri and Lisbon and Mario Miranda cartoon prints from Goa. While her room packs in a world of wonder, the rest of the house is a testament to the decor love and genius of her mother who continues to add her unique touch within its walls. Discarding hackneyed concepts of matching everything or using traditional elements, the mother-daughter duo are forever searching and bringing in new, bold and extremely thoughtful pieces to join them at home. Whether it is using cotton sarees as upholstery, rescuing an old cabinet with the right dose of yellow or turning garden pots and chairs a bright Turkish blue (if only for a while), their decor language comes with a smattering of love and a whole lot of adventure. Posted in Art, Artist, Books, Crafts, Decor, Delhi, Goa, Home Diaries, Homes, inspiration, People of India, Profiles, Textiles, Tips, Women and tagged Aradhana Anand, Blogger, decor, Delhi, Design, Home Diaries, Homes, inspiration, Shishir Bhatt, Singapore. Bookmark the permalink. Reblogged this on why is a raven like a writing desk?. More than just lovely, the décor is spectacular!